We presently reside in the U.K and enjoy holidays in Florida. We have either spent time with family or friends in hotels and villas. Over the years we have enjoyed memorable holidays in Florida. We have become so used to the lifestyle and enjoyed the feeling of being comfortable and at home. In May 2011 we purchased our holiday villa so we could have that continued sense of being at home on holiday with our family. As a family we treasure spending quality time together with the children. Time is spent relaxing by the pool in the peaceful gated community, going on day trips to the near by Disney theme parks or simply watching a DVD or cable T.V. We want you to enjoy your holiday villa with a sense of home from home, just comfortable. The gated community was an instant attraction the surrounding were beautiful and green. I like the assurance that we can feel safe in this community and I would be content to know that any family that comes here would feel the same. Another reason for buying this villa is that it is close to amenities and not too far from the Disney theme parks. A swimming pool is essential (for relaxation) in a villa, especially when you have been out and about the shops or around the Theme parks. This property is within Remington Golf Community and has many sight seeing advantages. The flooring to the house is completely tiled throughout with ceramic tiles. Some interesting books are provided in the living area for your reading pleasure and relaxation. Bedroom 1 has a en-suite bathroom with w.c, separate shower cubicle and bath. Bedroom 2 also has an en-suite with bath and shower and w.c. Bedroom 3 and 4 share bathroom no.3 which has a w.c, bath and shower. With beautiful ceramic flooring, consist of a extendable dining table and 6 chairs (but can seat 8), a sofa bed (king size) with centre rug and coffee table. Some reading books are provided for the guest. The area is designed to have a nice relaxation. This villa is within a gated golf community hence a 2 minutes drive to the golf course. The community also have a gym which can be use by guest. Notes on accommodation: Property has a games room, with a pool table, table tennis, darts board and a football table. www.gaapfloridavilla.com Outside: This villa benefits from a full size private pool with outdoor sitting table and chairs. 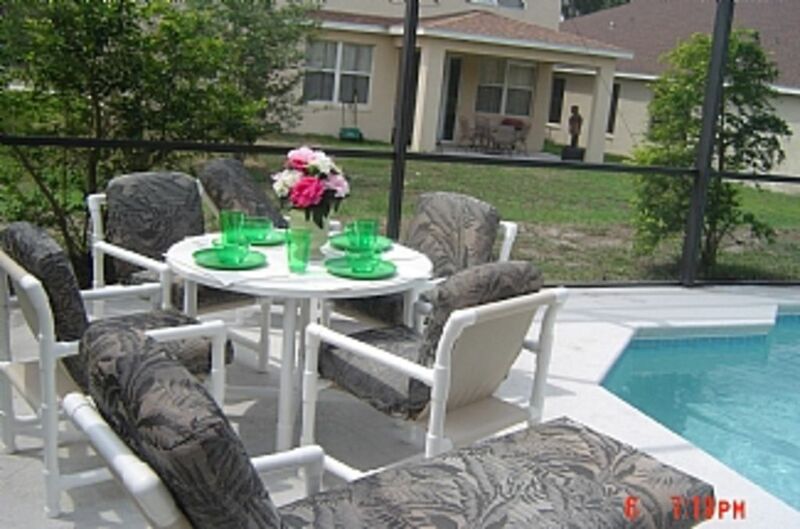 Also provided are two loungers for full relaxation and enjoyment in the sunny florida. Utility Room: Located next to the double garage, is equipped with a new top load washing machine and dryer. Also provided is an iron and ironing table. Cleaning / Towels / Linen / Maid service: Hoover, mop, dusters are provided. Also provided are bath and pool towels. The property is cleaned when guest vacate the villa however additional cleaning services can be provided at a fees during your stay. One off Cleaning fee of £75 will be charged. Other: The Family reception room has a 50" plasma TV with cable TV up to 250 channels, comfortable sofa chairs and centre table, nice plants that creates a lovely relaxed environment. Free USA local & long distance telephone calls and internet services. The scenery is great, each room has a homely feeling. Each bathroom is awesome especially the master bedroom, the jacuzzi was great. The pool was entertaining and awesome for all ages. It's our pleasure to have you as our guest. Hope to see your again soon. 100% recommended,very confortable,cleanI felt like in my house. Thank you very much mister obey. Glad you all had a lovely time in Florida and in our villa. We hope we can be of help in the very near future. All the best. Our stay at this home was wonderful! The home was clean and spacious. We loved the pool! The owners were very pleasant and available for any questions we may had. This home was perfect for our stay in Florida. We are so glad you enjoyed your time in our villa. Thanks you for your support. We hope to be able to accommodate you and your family again, in the very nice future. The house is spacious with ALL TILE FLOORs, excellent for wheelchair users. We selected this place hoping it would work well. The location was perfect for us as well. Everything was clean and organized when we arrived. If you do have wheelchairs, be aware the front entrance has a three inch high door threshold and the back door is about four inches so have a ramp handy. All the bedrooms were spacious enough for one or two wheelchairs/power wheelchairs in each. The neighborhood is also very nice if you like to take a stroll around. We are so happy that you all had a lovely time in Florida and in our villa. Also glad you found the villa spacious for wheelchair access. I am sure you all had a great time at the arena for your sporting event. Our friend who attended the games told us how outstanding the event was. We look forward to having you again as a guest. Thanks for the support. House looks better in person than in the pictures. Very clean and in nice area! House looks better in person. It is very spacious. The air stopped working at night and it was fixed right away the next morning with no issues. Owner is very nice. It was our pleasure to have you as a guest in our villa. Glad you had a wonderful time. Please keep in touch for any future vacation to Orlando. Cocoa and Melbourne beach is 60 minutes away from the villa in Somerset. Dayton Beach is about an hours drive and if you fancy a nice drive to Miami- Fort lauderdale beach is about 3 hours away. Orlando International airport is about 15 minutes drive away from the villa. The villa is 12 miles from the Disney Theme parks which takes about 16 minutes to get there by car. The villa is located about a 1 miles from restaurants on the 192 (a major road in florida) and 1 mile from the Florida Turnpike. The heritage Center and Silver Spur Arena is 5 minutes. The New Loop shopping centre and multi-screen cinema are located about 8 miles away. A number of well known shops are with 10 - 15 minutes drive from the villa.